Posted November 3, 2017 . 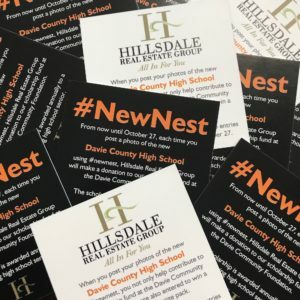 Since 2012, Hillsdale Real Estate Group has worked with the Davie Community Foundation to award a scholarship to a deserving high school senior. With each real estate transaction closed by HREG, a portion of the proceeds is donated to the scholarship fund. To date, Hillsdale has awarded six scholarships, each valued at a minimum of $500. 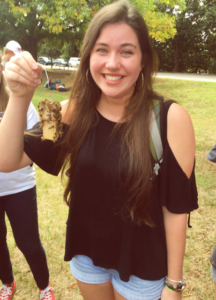 The most recent recipient, Laurel Hecht, is a freshman at NC State University. We recently caught up with Laurel to see how her first year of college is going. College life is great! I am 98% sure that I will major in communications with a focus in interpersonal communications. I love this degree because it is so flexible and gives me a plethora of options to choose for my career. I am most interested in going into marketing, journalism, or education. I am in the EcoVillage at State, which is a community service based living-learning village which focuses on teaching sustainability and how to incorporate it into our lives/futures! I was voted the chair of the EcoVillage Campus Events Committee, which means I help organize EcoVillage events and represent the village at campus events, like Open House and Campus Sustainability Week. On a less academic note, I am involved with NCSU Young Life, where we play games, have devotions, and eat Bojangles frequently. I also attend Vintage Church of Raleigh. The #NewNest campaign was a success! Hillsdale Real Estate Group is committed to continuing to grow the scholarship fund so more students like Laurel can benefit. Most recently, our office sponsored a photo campaign, aimed at building excitement and enthusiasm for the new Davie High School. We encouraged visitors to the new campus to post photos to social media using the hashtag #NewNest. For each post, HREG committed an additional dollar to the amount already donated. By the end of the campaign, more than 1200 photos had been posted, resulting in an additional donation of $1,219 to the Hillsdale Real Estate Group’s scholarship fund at the Davie Community Foundation. Hillsdale Real Estate Group was also a proud supporter of the Davie Community Foundation’s Annual Touchdowns for Education program this fall. For each touchdown the War Eagles scored on September 22, Hillsdale Real Estate Group, along with several other local businesses and individuals, made an additional donation to the general scholarship fund.